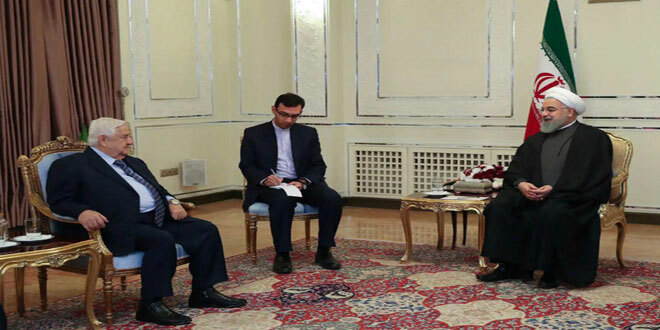 The meeting between Muallem and Rouhani discussed bilateral relations and comes ahead of a tripartite meeting between Russia, Iran and Turkey reports SANA. The enhancement of the standing strategic relations between Syria and Iran in various fields was a focal point of discussions at the meeting that brought together Foreign Minister Walid al-Muallem with Iranian President Hassan Rouhani on Wednesday. The latest developments in Syria and the region and the importance of continuing coordination between the two countries was also on the agenda of the talks, which were held in Tehran. Muallem used the opportunity to congratulate Iran’s leadership and people on the achievements made over the past 40 years since the Islamic Revolution, extending President Bashar al-Assad’s greetings to his Iranian counterpart on the occasion. Rouhani, for his part, stressed Iran’s support to Syria in its continued battle against terrorism and in the reconstruction process, stressing that having peace and stability restored to Syria forms one of the main pillars of Iran’s foreign policy. Muallem, in turn, reiterated that the successful visit of Jahangiri has given strong momentum to the bilateral relations between the two countries, stressing the importance of continuing coordination and consultation especially at this critical stage following the victories and achievements made in the face of the conspiracies that target both countries. He made it clear that Iran’s success in foiling the conspiracy against the country is also a victory for Syria and vice versa. Muallem also met with Iranian Supreme Leader’s Senior Advisor for International Relations, Ali Akbar Velayati, and discussed with him means to upgrade the bilateral relations and the developments in Syria and the region,with both sides sharing convergent views.